For the remarkable career Country Music Hall of Famer Roger Miller accrued over 35 years of service to music, he still never seems to get his proper due. 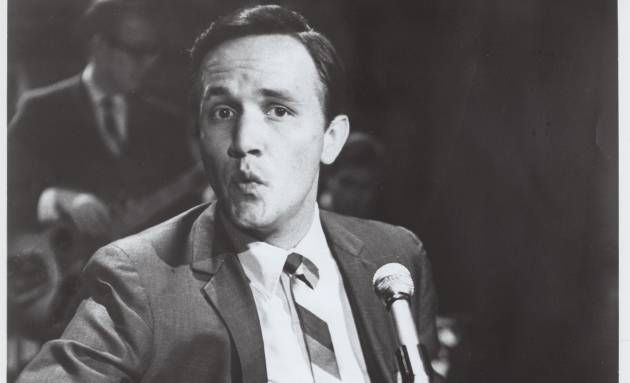 A true wordsmith and wit maestro, you’d be hard pressed to find someone to offer a sideways word about Roger Miller, even if they don’t like country music. For kids to old folks, Roger Miller can make just about everyone smile, and his genius has revealed itself to be just as potent in the present tense than it was when he was alive. Announced on Wednesday (6-20), a massive tribute album dedicated to the King of the Road will be making its way to music lovers. And though tribute records come down the pike all the time and make you wonder if your time and money is worth heaping onto songs you already know not sung by the original artist, this one seems to have a little something special in the recipe. All of your favorite Roger Miller songs like “Chug-A-Lug,” “Dang Me,” “Husbands and Wives,” and other more obscure ones will be included of course, and so will a handsome list of contributors that includes Dwight Yoakam, Jamey Johnson, Dolly Parton, Willie Nelson, Rodney Crowell, Kacey Musgraves, and a few names outside of the country realm such as Toad The Wet Sprocket. The impact of Roger Miller was huge. Despite the silliness, Miller was able to land twenty-one Top 20 singles in his career, including two that went #1. And that was just the songs he performed. Miller also had four #1’s performed by others, from “Billy Bayou” by Jim Reeves in 1958, all the way to “Tall, Tall Trees” by Alan Jackson in 1995 and Brooks & Dunn’s “Husbands and Wives” in 1998. He also amassed 11 Grammy Awards, speaking to what Roger’s peers thought about him. Do Wacka Do – Robert Earl Keen, Jr. I always thought “Lock, Stock and Teardrops” was a Waylon song. Nice to see Emerson Hart on there. He’s fantastic! Anyone here ever heard his album “Beauty in Disrepair”? Haven’t heard of it but based on the title I will check it out! I love that Dean Miller quote. I routinely complain about the lack of cleverness in country music today, especially in terms of humor and lightheartedness, the ability to turn a phrase or play on a word. It is indeed much harder than it appears. Paisley is underrated as a songwriter .The guy is brilliant . I’m glad he didn’t play the bro game …..he’s tried to be somewhat contemporary without sacrificing his songwriting gift . May not be here because he didn’t write it, but when I think of Roger I think Little Green Apples. The Jamey and Emmylou collaboration sounds promising. Seems like JJ always stands out on these tribute albums. Mandy Barnett, there’s a name I haven’t heard in a while. I was just listening to her the other day on one of my own Spotify playlists. She’s incredible! I’ve always thought she should have been a big star but it’s good to know she’s still performing. Some fun combos. I expect some heavy rotation on BRC come September. It’s fantastic that they’re including songs from Big River. There is no greater evidence of Roger Miller’s musical genius than his ability to write the music and lyrics for an entire Broadway musical with almost no knowledge of Broadway musicals. He left such a legacy but left us way too soon. Unrelated, but the new Garth Brooks “honky tonk” song was a major letdown. I always felt Roger Miller was a big influence on Brad Paisley. Good to see him on this. Damn, the lineup is stacked with talent. Roger Miller was an absolute genius, and this collection has the potential to be really good. “One Dyin and a Buryin”, “Reincarnation”, and other nuggets on here are fantastic tunes. Musgraves covering “Kansas City Star, thats what I are” should be interesting. Miller wrote so many deceptively deep songs, many of the early ones were only 80 or 90 second album cuts that have more subtle twists and turns in them than 95% of modern mainstream crap. Its a shame that too much of his legacy is a handful of songs that get put on “Craziest Kountry Hits” types of compilations. “King of the Road” is one of those songs that for me, gets the ultimate compliment- it is “un-coverable”. It is so iconic, theres no way anyone can improve upon the arrangement, instrumentation, vocals, anything. I hope this collection gets some long overdue attention for Roger. I thought Randy Travis did a wonderful rendition of “King of the Road”. Brought a smile to my face. I will be buying this. Thank you. Genius, and only one example. I saw a documentary on Roger where Kris Kristofferson marveled at the number of times him and others saw that word, but leave it to Roger to come up with that phrase. Not a big fan of tribute albums here…but this is a “must have”. Great songs & great lineup. Best songwriter ever by a measurable standard. Eric Church singing the Robin Hood song is worth the thirty dollars for this. I guess you can have your Cake and eat it too! Jamey Johnson featuring EmmyLou? Yes please. You can tell by the variety of artists, what a profound impact he had on the industry. Looking forward to this. Let’s also be reminded that Roger Miller could flat-out sing. Great range. Wonderful expression. He could play, too. He had it all. I think (and I could be showing a lot of favoritism since Miller is one of my favorite musicians) that he was one of the most talented people who existed in his day. He could pick on par with Roy Clark, fiddle as well as Magaha and Tommy Williams and circles around Curly Ray Cline. he had an incredible range! “Ive been a long time leaving” has one of the best lowest to highest spreads in a single song in all of Country Music. He had this genius lyrical style of great double meanings and other times just thoughts that nobody else ever thought of. He was also completely insane. My favorite story of his came from one of his tours, and apparently he never slept like normal people do and was just wired up at random hours. So he goes into a pawn shop and asks if this pistol is loaded, and the guy says no. I can’t remember where I read/heard that but it’s always stuck with me. Chesnutt with his version of You Can’t Do Me This Way. Was hoping Mo Pitney would appear on this album just because of the amount of Roger Miller tunes he covers live. Really looking forward to this though. This should be a fun one! Miller had great range, not only vocally, but lyrically. He could go from something as dark as Pardon this Coffin or Sorry Willie to something as thoughtful as Husbands and Wives to something as downright silly as Do-Wacka-Do. Just about every lesson a person needs to learn about lyric writing can be gleaned from studying his work. Underappreciated doesn’t begin to cover it. I tend to agree with the genius references. One of the all-time greats. There aren’t 5 better singer-songwriters in the known universe. I could listen to Roger Miller stories all day. His stuff is both eminently coverable and utterly un-coverable all at the same time. Coverable due to the genius of his songwriting. Un-coverable due to his performing prowess. Went on a date with this college girl. She didn’t like my Roger Miller CD that I had in. Told her she had to walk home or take the third boxcar, midnight train. I wish “River in the Rain” was included. Trigger… you really should review this thing. What an amazing album in several respects. It somehow captured the spirit of Roger Miller’s music in a way I haven’t seen done. Besides that, the crazy diversity of contributors in borderline shocking. Daphne and the Mystery Machines (who? ), Ringo Starr (what? ), Merle Haggard (when? ), Huey Lewis with Asleep at the Wheel (where? ), and Toad the Wet Sprocket (why?). I do not understand how this works, but I did almost every track. The HUGE misstep for me is Engine Engine #9, which is a horrible interpretation of one of my favorites. I didn’t really care of Invitation to the Blues either, but I at least understand what they were trying to do. This is probably the strangest tribute album I’ve ever listened to, and also among the best. I am a big fan of Roger, I am delighted to hear that his work will be covered by these artists looking forward to hear it. Congratulations to his family for making this happen.